Samsung and PTC Partnership enables faster deployment and accelerates return on investment for industrial IoT customers. Samsung Electronics Co. Ltd. today announced a partnership with PTC that will enable industrial IoT customers to get to market faster with smart, secure, connected products and services that improve operational efficiency through the ThingWorx® Industrial Innovation Platform and the Samsung ARTIK™ Smart IoT Platform. The partnership will allow the two companies to work closely to meet the needs of innovative industrial customers and enable manufacturers and system integrators to implement IoT projects faster, with less risk, and with higher return on investment. 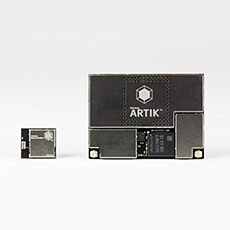 The Samsung ARTIK IoT Platform with SmartThings Cloud provides production-ready hardware, software and tools, together with integrated cloud services to enable companies to quickly develop secure IoT products and services. Through the partnership with PTC, ARTIK customers will be able to develop and deploy data-driven applications even faster. PTC customers will be able to leverage ThingWorx Ready certified IoT components and services from Samsung ARTIK for connectivity, device management and integrated security. “Industrial IoT implementations can be difficult and solutions often fail because they depend on many separately developed components to work together. The solutions are complex, expensive to install, and require expertise for critical functions such as security,” said James Stansberry, Senior Vice President and General Manager of ARTIK™ IoT, Samsung Electronics. One of the first initiatives of this partnership is an end-to-end asset monitoring evaluation kit, integrating Shoreline’s ARTIK-based hardware, ARTIK cloud services, and PTC’s ThingWorx platform. This complete, fully-tested hardware and software package securely connects legacy or new physical assets, and allows companies to quickly get data flowing into real-time IoT applications. The kit includes Shoreline’s iCast 2 cloud-configurable IoT Bridge for asset connectivity, ARTIK’s cloud services platform for secure device management services, and pre-installed ThingWorx Connectivity software on the iCast to connect to ThingWorx tools to rapidly develop and deploy scalable and secure industrial IoT applications and AR experiences. The new solution will be demonstrated at ARTIK’s booth (Stand 3A-438) at Embedded World. The evaluation kit is available immediately. The post Samsung ARTIK Smart IoT Platform and ThingWorx Unite to Simplify Industrial IoT Asset Monitoring appeared first on IoT Business News.